You’ll have to agree with us when we say that dogs are rarely underweight, right? They usually clean up the bowel in an instant and eat anything you throw at them. Canines are notorious for gaining weight due to snacking and overeating. However, there are a variety of reasons why your pets may need to pack on a couple of pounds. In that case, you are required to find the best dog food to gain weight and muscle. Today, we are going to review a few brands and help you pick the best solution for your pooch! If you are looking for a recipe that will offer you dog enough nutrients and help him lead an active life, then there is no better choice than Purina Pro Plan Sport diet. This meal contains 30% of protein and 20% of fat. Therefore, it’s the best dog food for bulking up. With this meal, your pooch will get all the necessary ingredients one high protein diet has to offers. It will fuel his body with energy and enable healthy weight gain. The chicken comes as the first nutrient to support proper digestion and lean muscles. On top of that, omega fatty acids and glucosamine will keep your pet’s joints in good shape. However, that’s not all, an optimum dose of antioxidants guarantees a healthy immune system in your pet. Overall, with the set of high-quality components, Purina Pro Plan Sport is premium nutrition for underweight dogs. Blue Buffalo Life Protection recipe is specially formulated for adult dogs, and it’s one of the best meals for muscle development. Its main ingredient is lamb, but the diet also features a wide range of whole grains, fruits, and vegetables. We should point out the presence of phosphorus, vitamins, and calcium to stimulate strong teeth and healthy bones. The formula is created to encourage optimal well-being, while rich proteins facilitate lean muscles. One cup of food has 505 calories, which makes this meal excellent for increasing your pet’s caloric intake. Additionally, omega fatty acids will boost up the skin and ensure a shiny coat. To conclude, if you are concerned about your pet’s muscle development, then Blue Buffalo should be your choice. The Merrick grain-free recipe is an excellent option of any canine. It is packed with wholesome nutrients to prevent any digestive issues in your pet. This recipe is formulated to meet the specific feeding requirements and to stimulate your dog’s health overall. Its most noticeable feature is high protein content. The diet is packed with 38% protein sourced from deboned chicken, salmon, and turkey meal. Moreover, flaxseed oil, fish, and blueberries will supply your pet with plenty of antioxidants and omega fatty acids. With the regular consumption, canines will maintain a healthy weight and enjoy every bite of this delicious dog food. To sum up, Merrick limited ingredient diet, will not only eliminate allergies but promote healthy weight gain. Earthborn Holistic sources its proteins from lamb and bison meal, to help you pet pile up a couple of pounds. This grain-free diet is designed to promote optimal health while keeping the dog’s body in perfect shape. To promote digestion, this formula contains pea proteins and tapioca starch. On top of that, a balanced amount of omega fatty acids will ensure a healthy and shiny coat. Alongside all these highly rated ingredients there are also probiotics, vitamins, and dog vitamins for weight gain. The Earthborn Holistic contains L-Carnitine that helps transform fat into energy, stimulating lean muscle mass. The things you won’t find in this dog nutrition are grains, artificial additive, and gluten. In all, you won’t find a better alternative to standard goods because Earthborn Holistic comes with all natural ingredients. Pet care companies often market their food as “all-natural,” and it’s an excellent way to hide potentially harmful components such as corn, wheat, soy, and MSG. However, the majority of high-quality nutrients that come from Nature’s Logic are proven to be 100% whole foods. This recipe contains premium proteins such as chicken meal and chicken fat which ensure your pet has lean muscles and a healthy body. On top of that, the kibble is coated with digestive enzymes and plasma proteins to help maintain proper digestion. They are enriched with natural minerals, vitamins, globulin proteins, and albumin. Plus, it doesn’t contain the traces the previous mentioned hazardous ingredients, making it the best natural formula. In summary, we would like to add that the high –quality ingredients of Nature’s Logic make it different from anything else you’ve seen on the market. Is your pet eating less recently? Do you know what caused this condition? A decreased appetite is common in the summertime, but if it starts repeating in conjunctions, then it can be a cause for concern. Underweight canines tend to develop poor eating habits. In that case, you should determine the possible symptoms that may affect your pet’s health. Additionally, it might be a good idea to start feeding your dog with high-fat dog food for weight gain. With underweight dogs, bones such as shoulders, hips, and ribs are quite noticeable. Considering there is no fat, the muscle mass will start shedding off, and any remaining muscle and skin will have a sunken appearance. Depending on the length of time your pet hasn’t been eating properly, he will display lethargy, and in some cases even hyperactivity. Healthy dogs have a healthy and shiny-looking coat, which isn’t the case with canines struggling to put on some weight. Due to lack of necessary nutrients in their diet, the coat starts to decay. You should notice symptoms like dull, harsh, and lifeless hair. The components such as omega fatty acids are crucial for the recovery. Canine are quite active by nature, especially working and growing dogs. Therefore, they require a high caloric intake compared to sedentary and elderly pooches. If nutrition doesn’t meet your pet’s calorie requirements, then he will lose weight and become lethargic. This condition leads to lack of energy and malnourishment, which is a severe eating disorder. Depression is a common symptom in underweight dogs. The inability to eat food and absorb nutrient properly can affect your canine’s mental health. He won’t be interested in regular activities such as running, exercising, and engaging in the family lifestyle. In this case, you would either have to resort to the vet’s help or try with the foods that fatten your dog. Diabetes – while strongly linked to obesity, a common early sign of diabetes is weight loss. Inflammatory bowel disease – a loss of appetite can indicate your dog is suffering from IBD, a condition that interferes with his digestive system. Other health issues – they include cancer, leukemia, kidney and liver diseases, as well as heart disorders. For more detailed analysis, take your four-legged friend to the veterinarian. Surgery can take a toll on your pet’s body. It’s a highly stressful situation, and loss of weight comes to a common symptom. After the recovery, your dog should resume regular feeding schedule. However, some canines develop an eating disorder, and they tend to lose weight even more. In that case, you can try various dog food to put on weight. If nutrition doesn’t provide necessary results, then seek professional help. Different types of parasites such as whipworms, hookworms, and giardia can mess with weight, dog’s appetite or the ability to absorb nutrients properly. If this is the reason why your pet is losing weight, then get rid of the worms. These parasites can spread to humans through water or oral routes, and they must be eliminated entirely. It’s one of the first steps you should take to help your canine restore a healthy weight and boost up his appetite. Dogs don’t have an easy way to let us know about their stress and anxiety, but a loss of weight can be a significant sign. Usually, thin canines tend to suffer from organ mutilation and hyperactivity due to hunger pains. If your pooch becomes overly excited or anxious, then that could indicate that he isn’t doing an excellent job in digesting and absorbing all the nutrients from the food. Not every case of weight loss is linked to parasites or health disorders. It could be something simple like a dental issue. For instance, a dog who eats wet food often develops plaque. Imagine not brushing your teeth for two years and expecting not to need some dental assistance. High-quality dry dog nutrition is specially formulated to clean canine’s teeth, while significantly reducing the plaque. Even though physical activity is excellent for your pet’s health, sometimes it can affect his weight. For instance, highly active canines require the best dog food to gain weight fast. This formula has all the necessary nutrients that will support his nutritious needs while keeping your dog’s body in excellent shape. Some pooches are very particular about the food they eat. For picky eaters, be careful to transition between brands gradually. Also, pay attention to feeding schedule and make sure that food is available at consistent times. For extra help read our guide about Best Dog Food for Picky Eaters. The majority of puppies will look skinny, especially in the first year or two before they begin to fill out. On the other hand, senior canines may also struggle to maintain proper body weight. In this case, there isn’t much that can be done about these age-related causes. You can only purchase fattening dog food brands to prevent loss of weight in your senior pet. Provide food high in calories – high caloric food is formulated for active, working and athletic dogs. High protein and fat diets are the best for this case. 30% protein and 20% of fat – this ratio should be applied when purchasing nutrition for your underweight canine. Canines process nutrients in different ways than humans, but the concept is quite similar. For instance, people who eat less than a few hours before going to bed tend to gain weight. So, using this logic, you can actually help your dog put a couple of extra pounds. If you are feeding your canine twice a day, then consider giving him a small portion in the morning and a large portion at night. In this way, he will store fat during sleep, instead of burning energy. Pet parents who ever breed dogs understand the importance of food high in proteins and fats. These nutrients stimulate growth and development in young canines. Proteins and fats can help your pooch gain weight over some time, and this method is applied gradually. You can expect the first results within a few weeks. If you are required to switch meat proteins for more nutrients, then mix a small amount of new food with dog’s regular diet. The Ad Libitum feeding strategy means that food is available at all times. It requires less knowledge and work and dogs can choose when and how much they eat. If you are breeding more than one canine, then it allows dogs to eat more peacefully. However, with underweight pooches, this feeding technique might help your pet add a few pounds. Try this feeding strategy for a couple of weeks. The first results should be evident shortly. May pet owners resort to best puppy food for weight gain. It is specially formulated for bone and muscle development. In this case, canines struggling to add a couple of pounds may benefit from this diet. High protein recipes are designed to promote healthy weight. They are usually packed with high-quality meats and fats, as well as highly digestible carbs. Providing high-calorie treat to your pet is another way to improve his nutrition. Extra calorie intake will boost up his weight; however, you need to make sure not to go overboard with treats. In this case, your dog can quickly jump to the other side and became overweight. High-calorie dog food isn’t the only way to help your pooch add some weight. You can also resort to muscle building supplements to accomplish the same effect. A large variety of supplements for canines are protein-rich powders, which you can mix with his regular food. They are usually comprised of 43% of fat, which can significantly increase your dog’s gain. Make sure to ask your vet for additional supplementation so you can fulfill your pet’s nutritional needs. Underweight canines require high-quality dog food that features a lot of proteins, vitamins, minerals, and fats. In that case, you should always choose quality over quantity. There are a lot of food manufacturers who promise nutritious recipes, but fail to deliver that. Usually, high-caloric diet is more expensive than regular one, which puts of many dog owners. But, when you are dealing with a pet who struggles to gain weight, the quality should be your main priority. All dogs are different and some of them, unfortunately, turns out to be fussy eaters. However, you can use specific tactics to lure you canine to eat better. While many pooches may not be found of dry food, it’s important to note that dry recipes have better nutritional values than wet ones. To make the formula more appealing, you can moisten the food with chicken broth or warm water. Stress can significantly worsen your pet’s condition. Make sure to pay attention to his behavior, considering anxious dogs tend to be hyperactive. You can spend more time with him; it will make your canine feel more loved and cherished. On top of that, regular exercise and daily walks have an impeccable impact on a dog’s mental health. Dog love eating human food, so why not add a couple of yummy extras to increase his appetite. Certain human food are highly palatable to pooches and can even have healing properties. For example, you can spice up their recipe with a vegetable, beef, or chicken broth. Other options include soup from canned tuna, non-fat plain yogurt, or non-fat cottage cheese. Fatty treats are equally bad for dogs and humans. Mostly, they are empty calories that don’t offer any nutritional value. We have to agree that some fats are healthy. However, too much fats can cause even worse health disorders. You want your pooch to gain muscle, not fat cells. Satin Balls recipe comes as highly recommended food for all canines struggling to put on some weight. This meal is meant to be served raw. It’s crucial to take the necessary steps and sanitize any surface when making this recipe. Since satin balls are fresh, they are quite easy to make. You just mix all the ingredients in a large bowl until everything is combined. The final mixture should be similar to meatloaf. Break off pieces of the loaf that are the size of a golf ball and then roll them until they are appropriately shaped. You can store the balls into a refrigerator for three days, or put them into the freezer. Is wet/canned food recommended for weight gain? Numerous experts recommend combining dry and wet dog food to boost up the dog’s weight. Even though moist food has lower nutritional value than dry food, the combination of these two will have an excellent impact on your pet’s health. What is the best brand to build a pit bull’s muscle? If you want to purchase commercial dry dog food, then we suggest Taste of the Wild High Prairie. It features 32% of protein which is more than enough for pit bull’s needs. On the other hand, supplementation such as Bully Max can help you pet gain muscles quickly and efficiently, and it’s the answer to the question on how to make a dog bigger size. This manufacture is the only one that offer a money back guarantee. 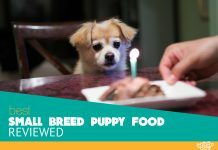 Is human food safe for malnourished dogs? Some ingredients can be quite beneficial for underweight canines. They can serve as a treat to stimulate their appetite. For instance, you can use chicken or beef broth, pieces of chicken and beef, even cheese and yogurt. What are some dog workouts for muscle building? We often get a question: how to make my dog muscular? Well, there are four simple exercises which can help you with muscle building. Spring poles – they provide your pet with hours of much-needed exercise. Flirt poles – they are designed to channel inner hunter in your canine and make him chase the prey. Weight pull – start with something simple like basic sled of grass and then gradually increase the weight. Dock jumping – swimming and water competition are excellent ways to increase your pet’s endurance and cardio. Keep in mind that lower than average weight in canines is a symptom, not a disease. But, before you try some of our food options, make sure to visit the vet. It’s crucial to determine what causes your pet’s malnourishment. A variety of health condition can affect his body weight, such as dental problems, cancer, diabetes, liver disease and so on. Once you determine the cause, you can resort to dog weight gainer food. We have reviewed some of the best formulas in the market which will help your pet put on a couple of healthy pounds. They are specially formulated for muscle gain while preventing digestive issues.